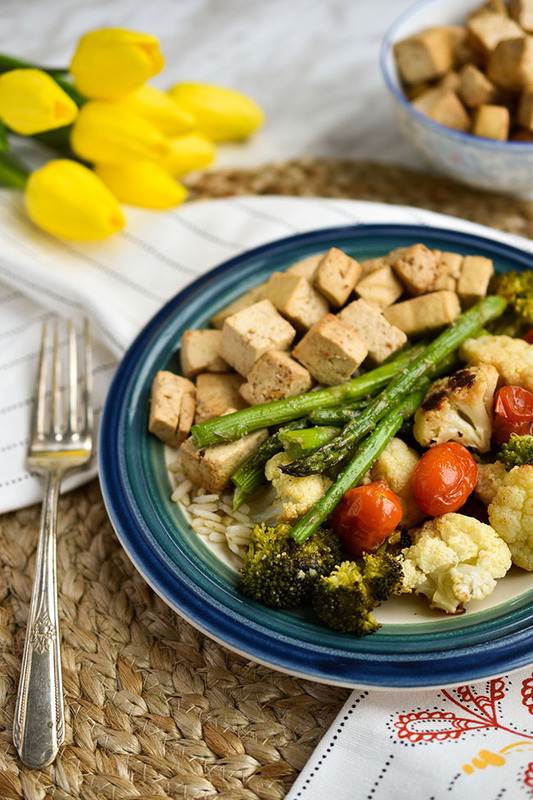 Whether you're 100% vegan or eating meatless meals a few times a week, it helps to have some simple, plant-based meal ideas in your repertoire. Tofu is an absolute essential in our house. It's a great source of protein and it readily takes on flavour from seasonings and spices. In the case of these marinated tofu cubes, I have flavoured them with a marinade of soy seasoning, nutritional yeast, sesame oil, lime juice, garlic and ginger. 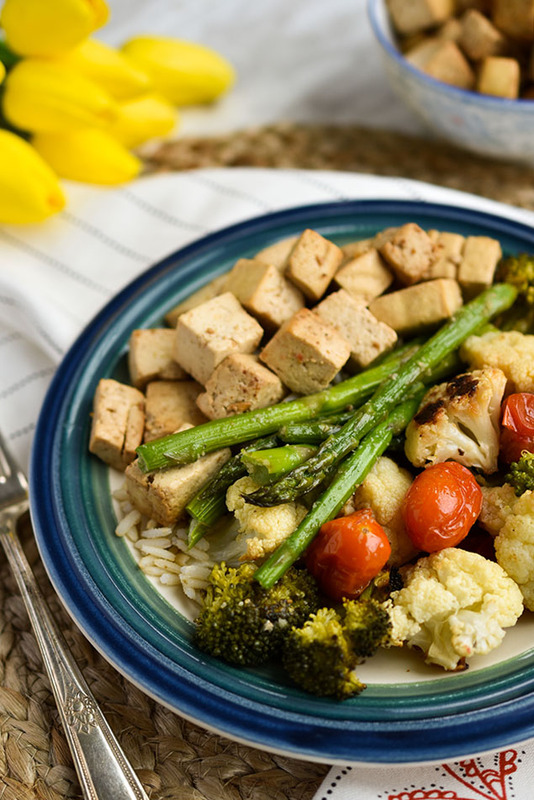 The marinated extra-firm tofu cubes are then sauteed in a little bit of oil for 10 to 15 minutes until the marinade dries up and the tofu browns nicely. Easy as pie. For a complete healthy meal, I like to pop veggies into the oven while the tofu is marinating. There's nothing like roasted veggies for a nutrient-dense side dish that feels virtuous but tastes delicious. And roasted veggies, while they can take a while to cook, are super easy to prepare. For this meal, I'm suggesting a mix of cauliflower and broccoli florets with grape (or cherry) tomatoes. I also recommend asparagus (roasted separately because it takes less time to cook). You could also do carrots, Brussels sprouts or whatever veggie calls to you (or remains in your refrigerator at the end of the week). This meal is great for a weeknight, when you're maybe feeling tired and uninspired. It has a few steps, but nothing complicated. 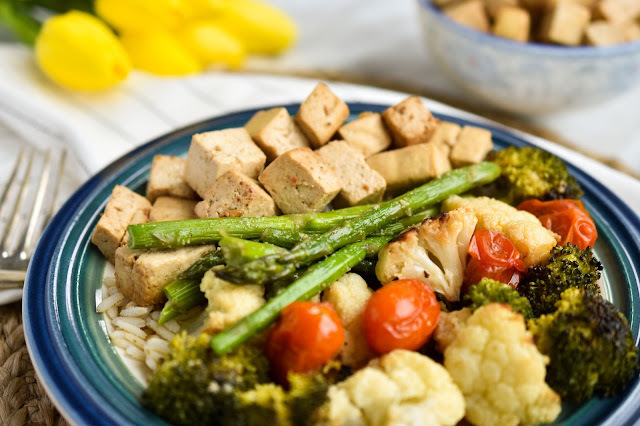 Put some rice in the rice cooker, set the tofu to marinade and get your veggies in the oven. 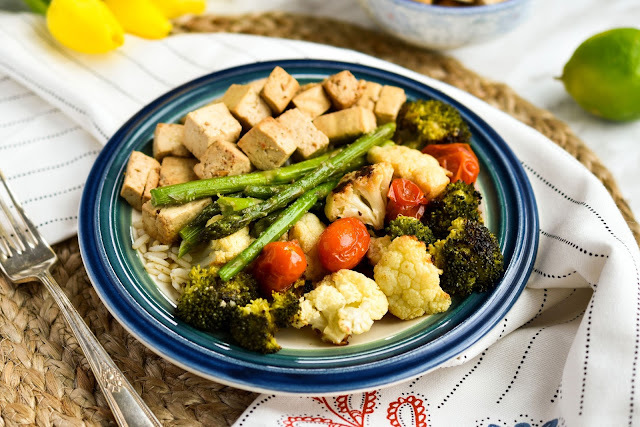 Fry up the tofu near the end of the vegetables' cooking time and you're good to go. 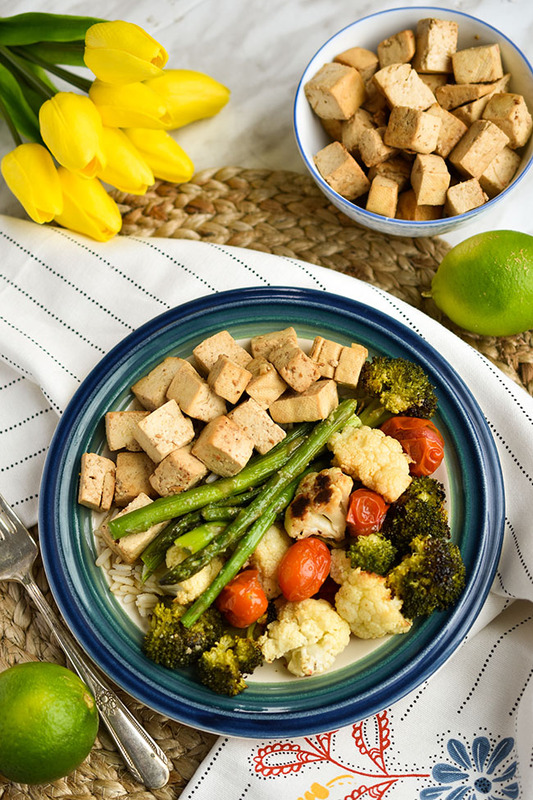 A warm and satisfying plant-based meal with an abundance of hearty veggies! What's your go-to plant-based meal? Whisk all ingredients (except for tofu) together in a large bowl. Stir in tofu. Cover and refrigerate for 30 minutes or more to marinate. Add 2 tsp oil to a large fry pan, over medium-high heat. Add tofu (drained of marinade) and saute for 10 to 15 minutes, until marinade has dried up and tofu is browned. Line a rimmed baking sheet with parchment paper. Add broccoli and cauliflower florets. Drizzle with 1 tablespoon olive oil. Toss. Sprinkle with salt and freshly ground pepper, to taste. Roast in oven for about 30 minutes, until fork tender. Add grape tomatoes in the last 15 minutes. Cut asparagus spears in half. Drizzle a small amount of olive oil in a baking dish or coat with cooking spray. Add asparagus. Drizzle with 2 teaspoons of olive oil. Shake on garlic powder, salt and pepper (to taste). Bake for 10 to 15 minutes until easily pierced with a fork. Serve with cooked brown rice or quinoa. Some breadfruit would be good with that. Interesting! I don't think I've ever had it.